I have been interested in photography (or some other art-form) my entire life. And about 25 years ago I discovered a small but thick book of glossy photos at a local library by George Brassaï. It was published in 1933 and titled Paris de Nuit (Paris at night). I was mesmerized by it. M. Brassai, a Hungarian by birth, spent most of his adult life in Paris and was friends with many artists and writers of the time, most notably Henry Miller. Well apparently M. Brassai lugged his camera with him when he and Henry Miller went out for their all-night jaunts. But as usual, I'm getting slightly off topic. Last summer my son and I went to Paris on holiday. I have always loved this city and had been there 4 times prior but not in more than 15 years. During that 15 year lapse cameras went from film to digital (for an amateur such as myself this is a good thing). The beauty of digital is that you can take hundreds of photos just to get a couple you want to save. I took more than 1000 photos in the week I was in Paris but only really saved a few dozen (click here, here, and here to see some of them). While in Paris we visited a few Museums, and one of them was the Centre Pompidou where I came across an instillation of photos by George Brassai which I lingered over. Paris, of course, is one of those cities (for me) where I often feel as if I am walking in a dream. Not only because of its incredible history but also because of its beauty. 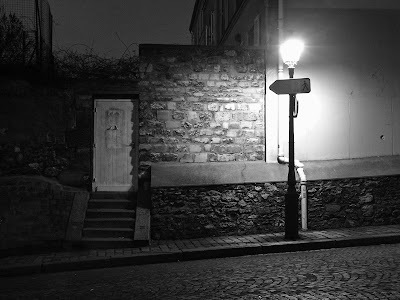 One of my favorite areas of the city is Montmartre, and where I took a great deal of photos. Anyhow, recently on my lunch hour at work I Googled images for Brassai and one of the photos that came up was the one pictured above. It's from his Paris de Nuit book. Again, I was messmerized...but this time I couldn't get the image out of my head. I had seen that shot before. Then it dawned on me. I had seen that image in real life. So I went back and looked through my Paris photos from last summer and found it, but it was more close up and taken in the daytime. I cropped the above photo to somewhat match mine. I mean no disrespect to M. Brassai (by altering his original) nor do I think that my image is even in the same league as his, it's just to illustrate my story. 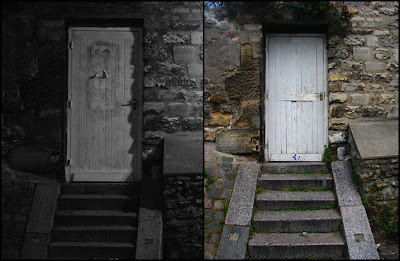 And there they are, side-by-side, an image of the same doorway separated by 80 (or 81) years.